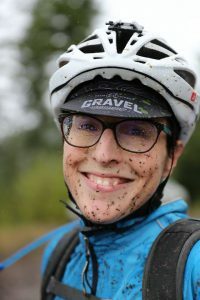 It’s been a few weeks since the first ever running of Cycle Oregon’s GRAVEL event. The tents have dried and the caked-on mud has been dutifully cleaned from every nook and cranny, yet the afterglow of this crazy fun event has not completely faded. If you missed this one, you really missed out. Friday afternoon and into the evening were met with a persistent light rain (that no one really seemed to notice) as a hearty crew of around 300 cyclists representing 8 states rolled into camp, unpacked bikes, set up tents, and found their way to the (free!) beer and wine tent. Camp had all the usual Cycle Oregon accoutrements –tasty food, shower trucks, blue rooms, helpful, smiling volunteers, a main stage – but the vibe felt just a little different this time. There were lots of new faces, lots of anticipation, and a roaring bonfire. From the main stage, Steve welcomed everyone, Tom walked us through the routes, and representatives from the Oregon Department of Forestry and the Tillamook Forest Heritage Trust talked to us about the history of the area and gave us an update on the Salmonberry Trail project. The rest of the night was filled with soulful Americana from The Get Ahead and accompanied by the crackling of the bonfire. Saturday morning we woke up to pretty typical northwest Fall-in-the-forest conditions – that is to say it was foggy and a little rainy. But that didn’t deter the riders any. 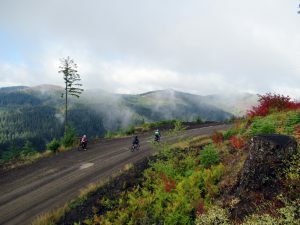 The rain did a nice job of taking care of the dust on the logging roads and the temperature was cool, but comfortable. And after that first hill, a 10% average grade climb, no one remained chilly for long. 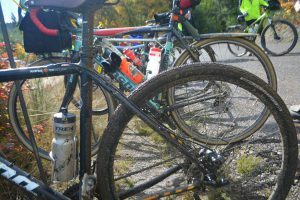 The routes for Gravel were “choose your own adventure” style with lots of opportunities to go your own way. But no matter which way you went, there were incredible vistas to take in, hulking logging equipment to see up close, and Autumnal splendor all around. And if you’re into bikes, about every make, style, and configuration of bike imaginable was represented. The cherry on top of this great day was a chance to stand on the actual tracks that will someday be the Salmonberry Trail. 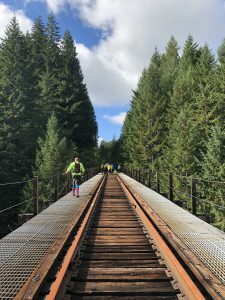 For those so inclined, they could bushwhack up a steep hill, assisted by a rope, to walk across the trestle hanging over a hundred feet in the air. This wasn’t easy in cycling cleats, but it was well worth it. Sunday was more of the same. Some rain, some mud, lots of fall colors and some truly otherworldly misty views across the forest. The routes explored the area south of camp and included another beast of a climb shortly after breakfast. Judging by all the mud-splattered smiling faces, it was clearly another fantastic day on a bike. Some riders even opted to spend a mellow Day 2 hanging around camp, listening to music and staying warm by the fire. 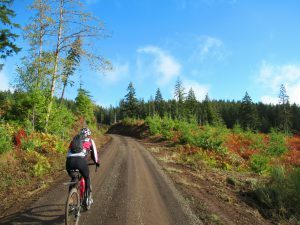 The GRAVEL event has made a great addition to the Cycle Oregon calendar and proved to be a great way to venture into parts of Oregon we have only begun to explore. So until next year – here’s to the roads less traveled!